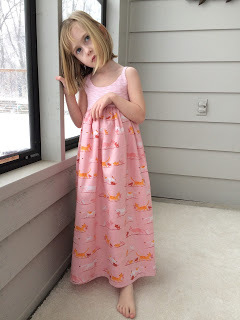 I’m so excited about the dress I just finished for my six year old!! The pattern is from RabbitRabbitCreations on Etsy (she’s got tons of great patterns at great prices! I bought a bundle of five patterns to try out). I was introduced to this pattern by my friend Emily and I’ve wanted to make more ever since. The original dress looked darling on Caitlyn but she didn’t love the fabric choices…she’s crazy…those fabrics were awesome…but whatever. 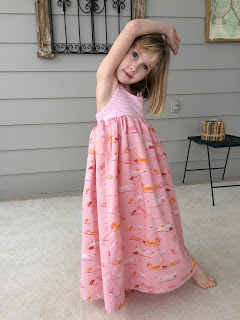 This time she picked the fabrics and this was a trial run version for a third dress that she wants for Easter…made with a knit ruffle skirt! So I needed to tackle this pattern again, on my own, and make sure I had the size correct. And check on making it in the longer length like my fashionista daughter wants. I’m so happy to say that it turned out beautifully. I always hold my breath with clothing because you just never know until that fitting. But the size was just right for her. My daughter is six, but tiny for her age. 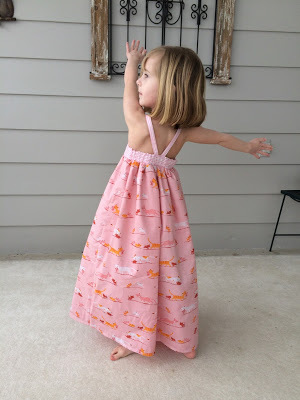 She wears a size 6 in a lot of clothes but I can still get her into a 5T if I need to…I made the size 5 pattern for her and it fit beautifully. I might even take the elastic in the back slightly shorter on the next version. She’s a petite princess. 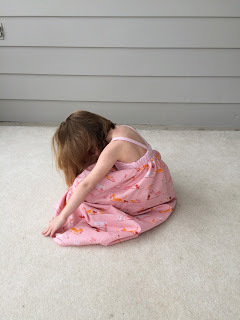 The dress is made from a quilting cotton on top, Simpatico, by Michelle Bencsko and the skirt is a lawn from Heather Ross’ Tiger Lily Collection. It is fully lined as well as I was concerned that the lawn would be too sheer. It was iffy so I opted to line it. It took me an evening to sew it together. I’m not a fast sewer as I think I have mentioned before. I’ll go faster the next time because the pattern will be more familiar to me. And thankfully she LOVES it. I put it on her to try on and forced (err…asked) her to take pictures and now she won’t take it off. I just asked her if she likes it and she said “I don’t like. I LOVE it!” High five mama! Cute dress. Glad I had boys. you have no idea!! lol She is a born performer. She can already council me on how to stand during a photo shoot. She actually takes better pictures of me than my husband sometimes. I just love seeing how kids express their enjoyment in something. Looks like you did great with both the dress and the child. 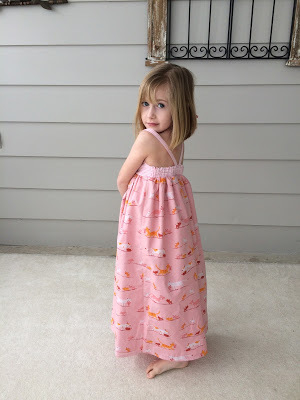 What a darling dress! And, such an adorable, opinionated little toot! Enjoy the fun. Such a fun photo shoot! What a reward for you!!! This dress is adorable! Nice pictures, she looks so happy. 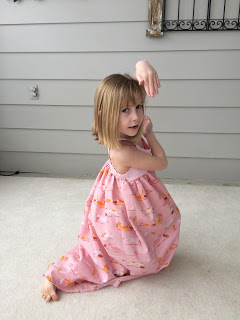 You can always tell when a little girl loves their dress how much they proceed to dance in it. Your adorable little Caitlyn loves hers for sure Angela! I just made a quilt using the Tiger Lily Heather Ross fabrics and simply adore them. I am so tempted to try cotton lawn – how did you like the way it sewed up? Is it very soft? I need to start paying attention to little girl's clothing again, now that we have a granddaughter. 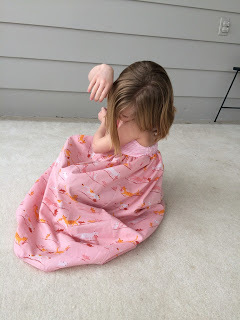 The first dress you made in this was so pretty too. And you are right that the pattern would make cute dresses for little girls in Africa.